In following with the month of November and trying to lead a life where its richness and depth trumps my to-do lists, and in the same vein as pursuing a life that described in this post about Brene Brown’s The Gift of Imperfection, I’ve been trying to keep a journal for a few minutes each morning for what I am thankful for: the small things like miniature pumpkins and the big ones like my family alike. This morning I am thankful for Anne Lamott and also her short book on prayer: Help, Thanks, Wow. I first read Anne Lamott ten years ago when we had to read her book about writing Bird by Bird for a class. Randomly afterward I realized I had a handful of friends who were really into her book Travelling Mercies, which is about her faith and was such a refreshing read. I’m thankful for a writer who can mentor me through a season of wanting to let go of my anxiety and frantic pace. There are three sections, each dedicated to a word in the title, and she walks the reader through admitting we don’t know what to do, the art of gratitude, and the way that wonder can change us and the way we see the world. I could subtitle this book “breathing deep through all the things,” because she describes how these prayer rhythms anchor her as a person able to face life with courage. It reminded me what a gift centeredness can be. Without revelation and reframing, life can seem like an endless desert of danger with scratchy sand in your shoes, and yet if we remember or are reminded to pay attention, we find so many sources of hidden water (page 53). We’re individuals in time and space who are gravely lost, and then miraculously, in art, found…In paintings, music, poetry, architecture, we feel the elusive energy that moves through us and the air and teh ground all the time, that usually disperses and turns chaotic in our busy-ness and distractedness and moodiness. Artists channel it, corral it, make it visible to the rest of us. The best works of art are semaphores of our experience, signaling what we didn’t know was true but do now (page 82). This entry was posted in anne lamott, faith, hope, nonfiction on November 17, 2013 by krobb08. I first heard of Brene Brown last winter when my friend Lindsay told me I had to watch her TED talk called “The Power of Vulnerability.” It was a game changer for my emotional health, y’all. 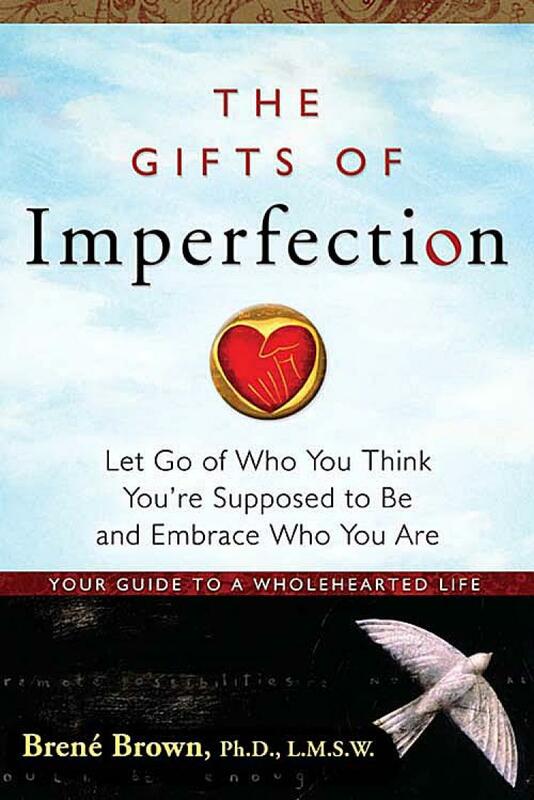 Then Lindsay and I decided we would both read her book The Gifts of Imperfection and it was the perfect follow up for helping me process through what it means to live with meaning and purpose and without anxiety. Reading the book and reflecting on Brown’s research and how it related to my life has been an incredibly powerful experience. I’ve slowly and reflectively read this book over the past five months or so. This post is a little vulnerable, but I think Brene Brown would be in favor of me sharing and owning these pieces of my story. My core spiritual beliefs (grace, love, forgiveness, stillness) have remained much the same over the years, but there came a time when I had to face the fact that from every angle I was hearing: strong people of faith ________. As a high achieving people pleaser, for many years I ran without stopping in my volunteer work, my actual work, and in the commitments I made in my free time. Sometimes despite hearing an overarching message of grace and love, I felt as though I was constantly not measuring up to what I was “supposed” to be doing, which was difficult for a perfectionist (though now I consider myself a recovering one) and felt as though I had to be apologetic for my introverted nature. I’ve taken the past few years to redefine what a spiritual life looks like for me and to (finally) learn to be ok with the fact that it does need to look like anyone else’s. A lot of authors have mentored me through this journey: Mother Theresa with Come Be My Light, Anne Lamott with Traveling Mercies and Bird by Bird, Joan Didion with The Year of Magical Thinking, Susan Cain with Quiet, Colum McCann with Let the Great World Spin, Eric Metaxes with Bonhoeffer, and of course the poetry and music of Over the Rhine. What I appreciate about Brene Brown is that her book seemed to pull together all of these literary influences and helped me to redefine and find freedom in what spirituality looks like for me. In the journey of trying to define what my spiritual life looks like now, it honestly can be easy to simply not think about it, thus avoiding existential dilemmas. But, the anxiety that so easily creeps in reminded me that being grounded and intentional is life giving and I noticed that not having an intentional grounding in faith, I became less hopeful in general, a bit cranky, and I forgot to look for beauty. Brown’s definition of spirituality piqued my interest because I was (still am) so tired of the minutia of Christian theology: “By spirituality, I’m not talking about religion or theology, but I am talking about a shared and deeply held belief. Here’s how I define spirituality: Spirituality is recognizing and celebrating that we are all inextricably connected to each other by a power greater than all of us, and that our connection to that power and to one another is grounded in compassion. Practicing spirituality brings a sense of perspective, meaning, and purpose to our lives” (64). When she wrote “It’s not about denominations or dogma. Practicing spirituality is what brings healing and creates resilience. For me, spirituality is about connecting with God, and I do that most often through nature, community, and music. We all have to define spirituality in a way that inspires us,”(74) I was reminded of the life nature gives me and how washing dishes or walking with music centers me, and how dinner with my husband and great friends grounds and connects me. One of the messages I have struggled with as a Christian is that “everything happens for a reason,” which I simply cannot buy into no matter how many scripture based conversations I have. This felt really isolating, especially in the early days of this journey. I have landed in a place of confidence and rest with this issue and others, and reading Brown’s book helped give greater clarity to me: “At first I thought faith meant ‘there’s a reason for everything.’ I personally struggled with that because I’m not comfortable with using God or faith or spirituality to explain tragedy…Here’s how I define faith based on research interviews: Faith is a place of mystery, where we find the courage to believe in what we cannot see and the strength to let go of our fear of certainty” (90). Faith as a beautiful mystery has been one of the most healing perspectives I’ve run across. To close, one of my favorite parts of the book was when Brown discussed the fact that we can change our neurological pathways, something one of my old pastors used to talk about, too. It is possible to physiologically change our patterns of thinking (google neuroplasticity). I’m now living in a way where I am trying to incorporate rhythms into my life that help me feel grounded, connected, grateful, and covered in grace. This is happening for me through reading, taking time to be creative (watercolor and calligraphy lately), cooking, looking for beauty, and practicing stillness. It looks different, but feels beautiful. This entry was posted in authenticity, brene brown, existential struggle, faith, healthy rhythms, identity, nonfiction on November 2, 2013 by krobb08.